You can take a look at some of the most popular hosted blog platforms to see which might be the best fit for you and your new blog. These blogging software packages have been around for quite a while and are regarded as some of the best that the blogging community has to offer. All blogs are free and hosted for you, with no hassles and no mess. Blogger offers a wide variety of free templates to get you going, which you can customize in a number of ways. The publishing tool includes Google AdSense (a blog advertising program) and other neat elements, such as polls and lists, integrated into it, allowing you to add functionality to your blog. Because it is owned by Google, Blogger links seamlessly with your other Google accounts, including Gmail and Google+. If you don’t want Blogger to host your files, you can save all your blogging files to another server. In 2005, the popular WordPress blogging platform launched a hosted service, in addition to software that you can install on your own server. WordPress.com offers a clean, easy-to-use interface, and bloggers tend to see it as more flexible than anything else on the market. Now that WordPress.com has added new functionality and additional themes, you can set it up very quickly. On WordPress.org, you can get software to install WordPress on your own website. 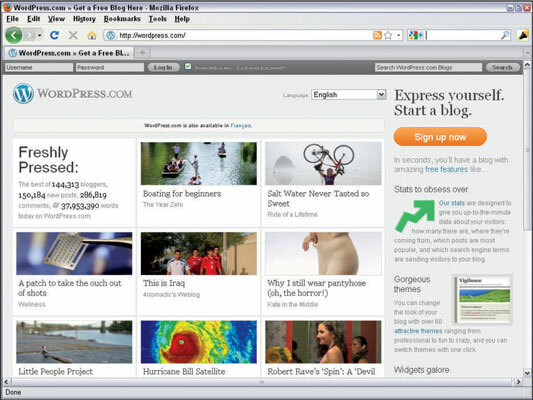 TypePad was launched in 2003 to great fanfare. It allows you to do more than just blog; it was one of the first blogging platforms to offer the capability to create static content pages. TypePad pricing starts at $8.95 a month and ranges upward, depending on the services that you include. TypePad also offers a 14-day free trial for new users. Tumblr, which was purchased by Yahoo! in 2013, is a fun and really easy-to-use hosted blogging service — and it’s free. Tumblr blogs are a little different from other major blogging platforms in that it is really easy to re-post material from another Tumblr blog to your own blog, so sharing is a big part of the Tumblr experience. Remember to read the terms of service carefully when selecting a hosted blog platform. You may not actually own the rights to the content you are posting!